According to a new study, the global number of smartphone users will fall just short of 2 billion people next year. 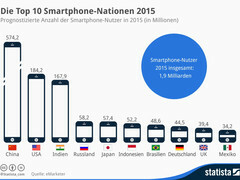 Which countries will lead the way in smartphone sales over the next few years? According to a new study from market observer eMarketer, nearly 2 billion people will use a smartphone in the coming year, a figure that represents more than a quarter of the world's total population (7.3 billion people). The results presented by eMarketer take into account every person who possesses a smartphone and uses it at least once a month. eMarketer also predicts that the total number of smartphone users in the world is estimated to rise to 2.15 billion in 2016. In 2018, the company predicts that there will be 2.56 billion smartphone users on the globe, more than a third of the world's population. The study finds that China will continue to be the world's largest smartphone market for the next few years, although a wave of changes is about to hit the top 10. In 2015, Russia is estimated to overtake Japan as the fourth largest nation by smartphone users, while India is estimated to take the second position in the charts from the United States in 2016. The researchers believe that Indonesia will continue its expansion, and will be the fourth largest smartphone nation by 2018. 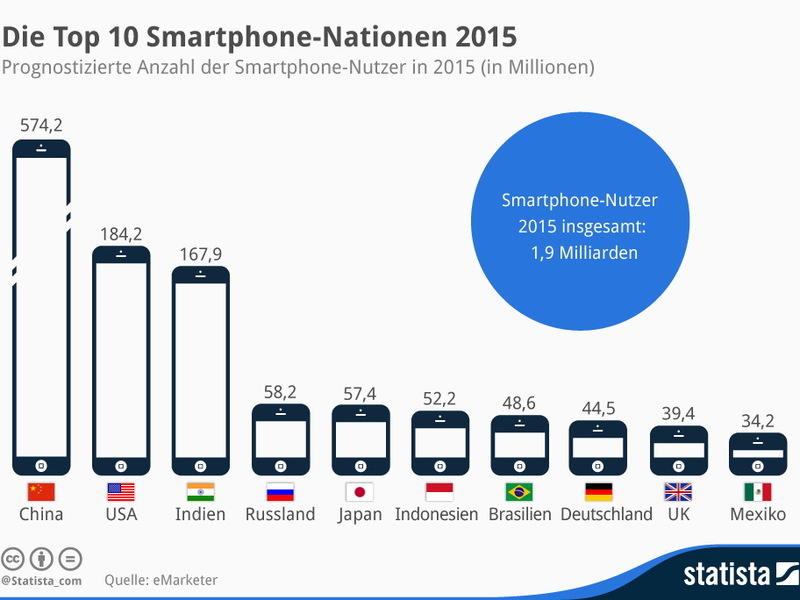 The study's European forecasts for 2015 claim that Germany will break its tie with the UK and become the continent's largest smartphone nation with 44.5 million smartphone users. The UK will be home to 39.4 million smartphone users by the end of next year. France (32.9 million), Italy (28.6 million), and Spain (25 million) are believed to complete the European top five of 2015.